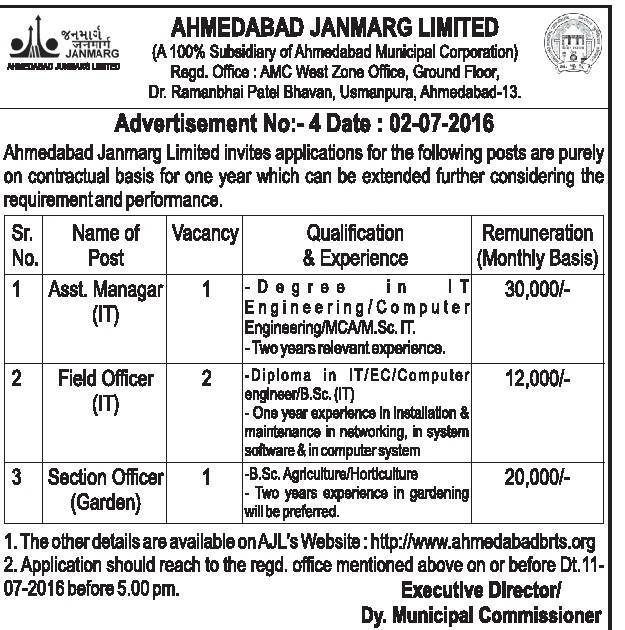 Ahmedabad Janmarg Limited has published a Advertisement for below mentioned Posts 2016. Other details like age limit, educational qualification, selection process, application fee and how to apply are given below. Degree in IT Engineering / Computer Engineering / MCA/ M.Sc. IT, - Two years Relevant Experience. Diploma in IT/ EC/Computer Engineering/ B.Sc. (IT) - One year experience in installation and maintenance in networking, in system software and in computer system. Remuneration : Rs. 12000/- Monthly Basis. B.Sc. Agriculture / Horticulture - Two years experience in gardening will be preferred. Remuneration : Rs. 20000/- Monthly Basis. Address to sent Applications : AMC West zone office, Ground Floor, Dr. Ramanbhai Patel Bhavan, Usmanpura, Ahmedabad 380013.